After this has been done, EH will find your information in the same way as it finds information in other EH databases. The database has to be formatted correctly so that EH can recognize what is a remedy, a chapter, a pathology, etc. Without this minimal formatting EH cannot make an analysis or search for your newly added information. You can create more than one EH database. For example, one for new provings and one for your successful clinical cases. You can also create a different database for a different language. And, if you wish, you can mix languages within one EH database. Last but not least: the EH databases you create can be shared and used by other EH 2.1 users without limitations. The great advantage as compared to having your text in a Word processor, is that you will be able to use all EH search, display and analysis functions for your own text. A detailed manual with screen shots will help you create an EH database for the first time. 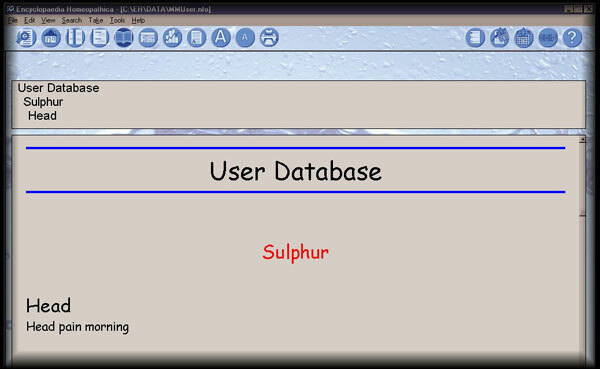 Watch how these steps convert normal text to a fully functional EH database! 1. Type the text or import it from a word processor into your EH database. 3. Then select the text you want to format starting from and including the remedy name. 4. Finally, right click and choose 'Format the selected text': the job is done. Now your document looks and functions like any other EH database. To show the structure which is now applied to your text, you can right click and choose 'Show reference'.